Features built-in CD player, RCA inputs and USB port. Integrated preamplifier, mixer and amplifier. Durable molded, tooled hard plastic case. 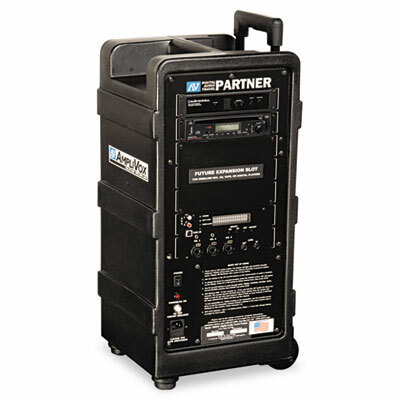 250W dynamic output reaches an audience size of 7,500 in rooms up to 25,000 sq. ft. Includes a built-in UHF receiver with lapel mic and wireless transmitter. Full function remote control lets you control all system functions from up to 30-ft away. Features a built-in CD player with pitch control as well as RCA auxiliary inputs and a USB 1.1 port for connecting a computer or laptop. Integrated preamplifier, mixer and amplifier circuitry provide rich, intelligible sound indoors and out. Durable molded, tooled hard plastic case features retractable handles and heavy-duty wheels.